Back in school, when I was in class VII and the public examination was round the corner, we were exposed to an advanced level of learning – mugging. Here, anything from microbes to Mughals could be learnt by rote. And the Andhra Pradesh State Syllabus offered an additional benefit of learning math problems and physics formulae too by heart. So all we had to do when we heard the slightest mention of the word ‘amplitude’ anywhere, was to get up and say ‘Lambda into two by N’. Not to disregard it completely, but it was too convenient a method and rather useless. But children these days are at an advantage of learning through experience. 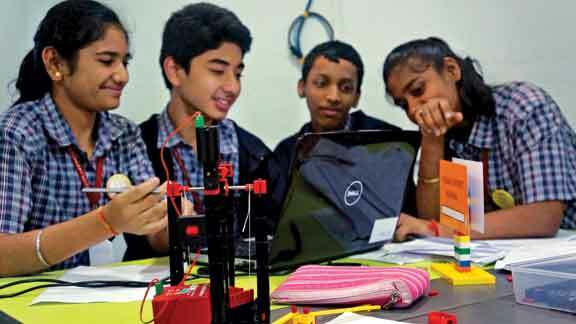 Schools in the urban and semi-urban cities today are equipped with laboratories and experiential learning modules that help children use technology and resources in a way that aids in understanding the practicality of theory better. Especially in subjects like science and maths, where the grainy textbook image of a hydro-turbine looks like a low-cost harmonium box and the 6th side of a 2D cube is always elusive, practical learning definitely scores over anything else. To add to the advantage, the convergence of educational cultures nationally and internationally, through science and math olympiads, quizzes, and other competitions, students are not only motivated to perform better but also inspire their peers towards this new world of opportunity to redefine their skills, which is also a respite from the conventional mode of examination-evaluation process. Also, since it’s a given that only the smarter kids get selected to such competitions, every student tries to act smart, which is the first step to being smart! Creya Learning Solutions, a part of Kindle Experiential Learning, who provide project-building skills and material to schools held one such innovative event, The Creya Ignited Minds Challenge, in November in Hyderabad. Students from 19 schools in the city took part in this challenge. Why this is innovative is because, generally, in competitions involving children aged from 11-13, it has to be extremes. Either the kids have to be transfixed behind a podium answering questions on a contest, where the only movement they are allowed is to hi-five each other or worse, a face-palm, or it has to be a frolicking sport where children are, well, just children. Both of them require the brain to work, but in different directions. Now, combining these separate efforts of the left brain and the right brain and fusing them to create an idea is the real challenge. What Creya did was interesting. It divided the challenge into two parts, wherein one part, Digital Media Learning (DML), would require half the number of students, six to be precise, from each school to exercise their creative skills in understanding and developing media products using digital media tools like Gimp, Windows Movie Maker, and cameras while the other part, Academy of Engineering and Robotics (AORE), would require the other half of students to explore their engineering skills by analyzing and building viable models such as cranes, wind mills and dynamos out of building blocks that Creya provides. The challenge was spread over two days. A Boot Camp was organized the first day, to provide orientation and coaching to the participants and help the students get acclimatized with the hardware, software and information they could use to build their end project by which they would be judged. In addition to this, the students were coached on the importance of narratives in conceptualizing a script for the media project and Design Thinking in ascertaining targets for their engineering models. On the second day, the students of both the sections were united and given the Capstone challenge. The challenge was to build an innovative, workable model of a disaster management technique in case of a natural calamity such as floods that would help in reaching aid to the victims, and to conceptualize a story, write the script, draw storyboards, enact and shoot the film for spreading awareness about the relief offered and the significance of such methods. This will require all the students to think, analyze, design, draw and build together by applying what they learnt and using information available on the internet. What followed next looked nothing less than a busy set of a film. A melange of ideas, good, bad and ugly, scurrying children looking for loose nuts, diligent coaches drawing the line between helping and hinting the students, glasses spilling, fans spinning, batteries whirring, faces smiling and frowning, the whole place was in a hush of high noise. By the end of noon, all the teams were ready with their models. Although some ideas were clearly ahead of the others, it was mind-bending to see what the kids could create with just a day’s coaching. Their enthusiasm peaked towards the end when they displayed and explained their models to the panel of judges. Another good thing about the event was that the prize money announced was directly handed over to the children in the form of cheques, which gave them the adrenaline rush of being rewarded for their effort. This works to the students’ advantage on many levels. It’s a coming-together of various schools and students, and hence peer interaction and evaluation helps them in assessing self-standards. As the volunteer photographer, I had the advantage of looking through my lens and smiling at the organized bedlam of the kids dropping parts, throwing tantrums and pulling strings together. As part of the exercise, I conducted interviews, if crouching in a corner to gather scuttling kids and asking them questions that would obviously elicit, ‘It was amazing’, ‘I enjoyed it’ responses qualifies as interviewing. But I cannot deny that they were genuine feelings which I could have never given my maths teacher who created more problems for me than solving. The organizers on the other hand got busy feeling successful and planning a dinner party to celebrate the event that put effortless smiles on their faces. And when do you know an event is successful? That’s right! When the kids refuse to leave the room even when the lights are being put out. The dense, cheering crowd drained into a trickle of humans and smiling kids greyed behind the window panes of vehicles. And with that all good things came to an end that night! The author is doing her master’s in the Department of Communication, University of Hyderabad. She can be reached at sindhu148@gmail.com.